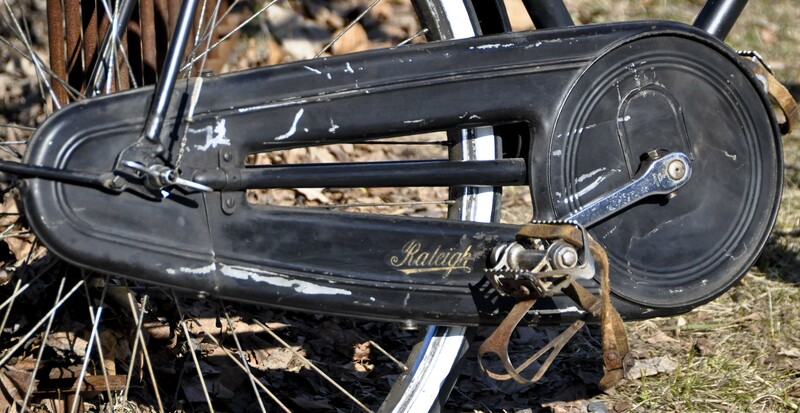 I have been watching for an old Raleigh for quite some time. I missed out on a nice 1986 DL-1 at the Madison Swap meet in February. I was blocked on an imported Superbe by a timid seller who was worried because I don’t buy a lot of stuff on eBay (ask me over a beer some time). But recently I was lucky enough to catch a 26 inch wheeled (650A or 590mm berad seat diameter) 1936 Raleigh Sports on the Madison Craigslist before it exceeded my budget. I was the first to come up with $300, which I think was a pretty decent buy for this bike. It rides nice as is, but you know me, I will certainly have to do some upgrades. Without a doubt I know I need new tires and a sturdy kick stand or vintage wheel stand. I’m also thinking about dyno hub options, and even wishing for a coaster brake rear hub. For the tires, what do you think: creme colored Schwalbe delta cruisers or Michelin gum wall world tourists? The biggest questions is should I live with the vintage patina of the old paint or gp for a new finish? I could get it powder coated a nice shiny black or Raleigh Green and ask Jason to do some fancy touches and decals. OK, all you vintage Raleigh freaks out there, what do you think? Upgrade? Upgrade with period bits? Paint or keep the vintage patina? Giddy-up you old nag! Am I a freak, or does this bike look naked without a bell? Ding Dong? Crane? Old, but really comfy saddle. This is the most comfy leather saddle I have ever trusted with my best asset. 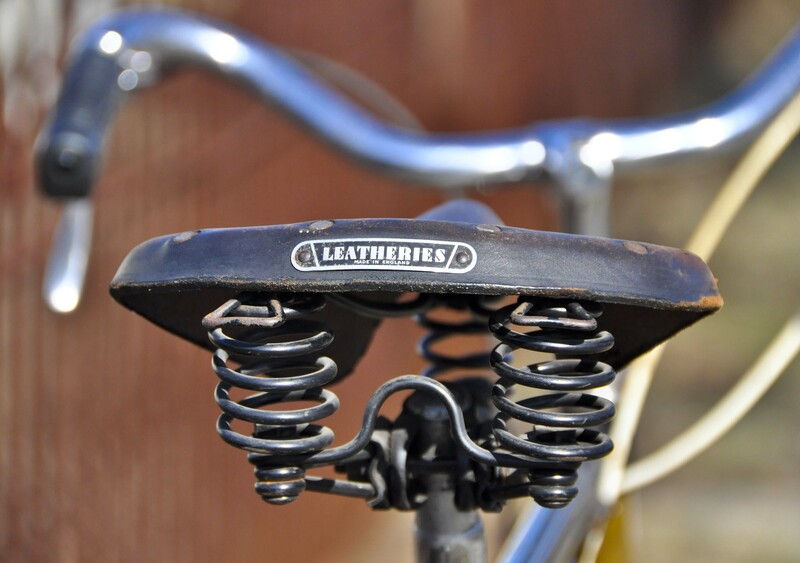 Perhaps you just have to wait 75 years for a leather saddle to hit its sweet spot.Nice brazed clubman style stem.Nice brazed clubman style stem, but the handlebars are only 42mm wide. That is really narrow for a city bike. Nittos? Vintage Schwinn?Radial lacing on the front wheel. What was old is new again. Dig the "quick releases." But do I go new dynohub laced to a vintage hub? S/A dynohub with brake? I need a light. Radial lacing on the front wheel. What was old is new again. But do I go new dynohub laced to a vintage hub? S/A dynohub with brake? I need a light. The full chaincase was the "must have" item I was looking for. There are plenty of nice Raleighs out there with chainguards, but those with the chaincase somehow really stand out in the crowd. This would be an easy thing to have painted or powder coated. Jason could do the decals/stencils.Nice brazed clubman style stem, but the handlebars are only 42mm wide. That is really narrow for a city bike. Nittos? Vintage Schwinn? Radial lacing on the front wheel. What was old is new again. But do I go new dynohub laced to a vintage hub? S/A dynohub with brake? I need a light. Nice brazed clubman style stem, but the handlebars are only 42mm wide. That is really narrow for a city bike. Nittos? Vintage Schwinn? Dave, congrats! Very cool. Soma and velo orange also offer some good handlebar choices.Also, have you thought about the S/A two speed kickback hub w/ coaster brake? Nice score! I say keep the original paint. I also vote for the creme Schwalbes, but all black tyres would be period correct. 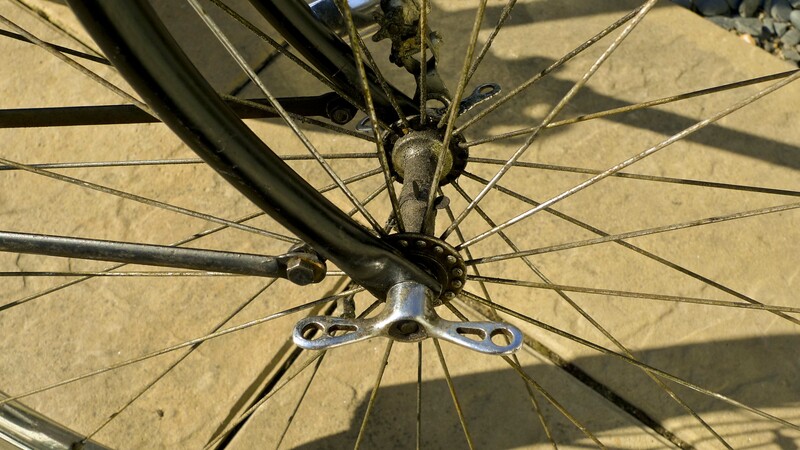 The radially laced front wheel is a real headscratcher – I’ve never seen that on a Raleigh Sports. Be careful with the brake cables – they are special to Raleighs of that era and replacements are just about impossible to find anywhere. Beautiful Ride. Here is a blog written by my sisters father in law. He almost never updates his blog, but when he does it is an absolute gem. In honor of your new ride I introduce you to Bicycle Specialties. Nice Dave! I’m for keeping the patina. After a good clean and wax they usually look pretty nice. 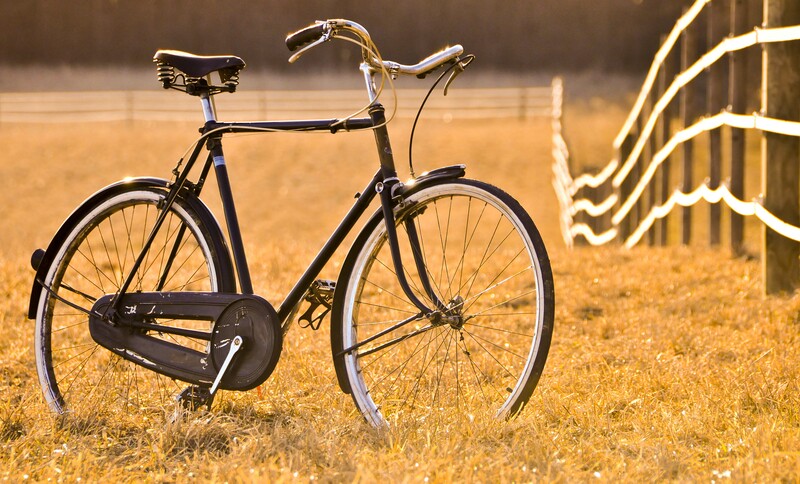 I still have my Raleigh Superbe. Lots of great memories but now it just stays on the trainer. Really, a 3sp Raleigh Superbe on a trainer? Chaincase and all? You are pulling my leg, right? That is a pretty nice bike too, albeit the rod brake model. If it was the loop frame, I might have bought it too. One more bike! Hi –here’s my 2 cents. Beautiful bike! i would definitely keep the patina and not repaint. 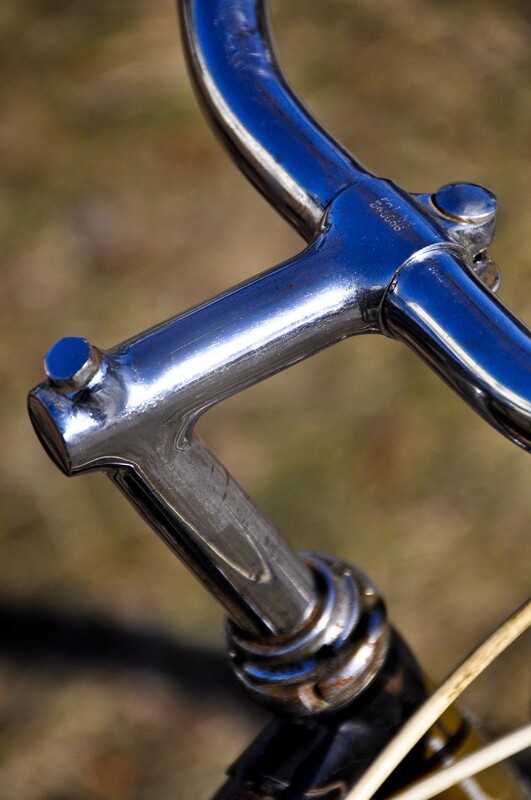 Another handlebar source option [they have a north roads style in alloy] is Velo Orange. I have the VO bar on a 66 gold Raleigh sports and like them alot [some say nittos are the best] but i would have kept the originals if i wasn’t also using a new stem [basically cause i needed to raise stuff on the too small for me 21" frame]I am puzzled why you think the bars are too narrow, i would keep the originals if possible. . I love the wingnuts, i would consider trading a NOS 64 front Sturmey dynohub mounted to a steel endrick 650a i happen to have for your set….As for lighting i would go original with as front dyno and sa lights but you certainly have modern options you could check vo or rivendell among others. The chaincase is nice! The rear Sturmey dyno 3sp are also nice, i have one on a bike but they are heavier…Have fun!